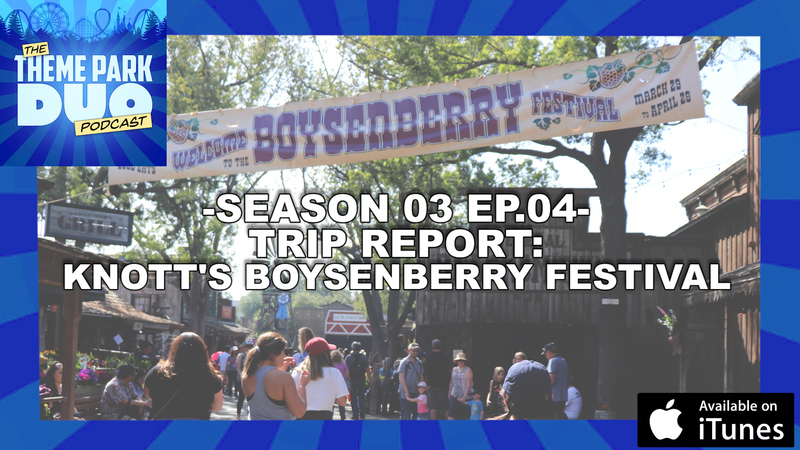 On this episode of the Theme Park Duo Podcast, The Duo reminisce about all the incredible food and drink they had at Knott’s Berry Farm for Knott’s Boysenberry Festival! Knott’s Berry Farm is the birthplace of THE Boysenberry and each spring, Knott’s celebrates the flavorful berry and its historic roots during the Knott’s Boysenberry Festival with unique food and live entertainment. The 31 day food festival features over 75 one-of-a-kind boysenberry inspired dishes, drinks and more, plus foot-stompin’ entertainment, the Wine and Craft Brew Tasting Garden, and family fun everyone will love! From sun up to sun down, the festival offers good ol’ fashion food, fun and entertainment. We also have a Theme Park Bulletin where we talk about Mickey’s Philharmagic coming to Disney California Adventure Park from the Magic Kingdom and Midsummer Scream announcing their very first panel! We then jump into a Haunting Headlines where Universal Orlando Resort and Universal Studios Hollywood have announced the return of Stranger Things to Halloween Horror Nights! All of that and so much more on this incredible episode!